Do you remember a few years ago when there was a fashion for books about disabilities? They had snappy titles such as My Sister has a Visual Impairment. You could be sure of finding them on the library shelf because they were not popular with young readers. Then there was the ‘books as therapy’ genre. These had straplines such as, ‘a story for children who have Anger Management Issues’. They weren’t best sellers either. 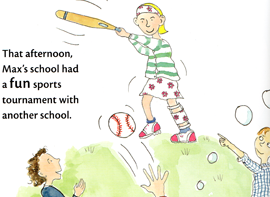 Those who work with children with disabilities or special needs – and that is just about every classroom teacher – have been looking for a story which is a cracking good read but features a child who happens to have a disability. 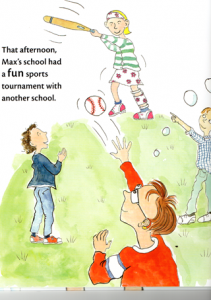 At last it is here: Max the Champion by Sean Stockdale and Alex Strick is brought to life with vivid, busy pictures drawn by Guardian cartoonist Ros Asquith. Max is sports mad. Even his two favourite toys, a bunny and a tortoise, are dedicated fans. He could be described as being obsessive: even his still life painting features contains a nice collection of balls. It is at this point that the observant reader might notice that Max has a behind-the-ear hearing aid and that he needs to use an inhaler when he gets too excited. As you look through the book you realise that many of the characters have some form of disability. There are Makaton symbols on the classroom wall, a man out walking with his Guide dog, an old woman who needs a walking stick, a child with an oxygen tube. For years we have expected that fiction will reflect the ethnic diversity of the UK but it still seems unusual to see children with special needs. Max the Champion is an important landmark because it is a delightful picture book which reflects the range of disabilities in our communities. Max also has his own website: //www.maxthechampion.co.uk. This has free resources including a colouring sheet, a reward stickers template, bookmarks and a lesson plan. There are also links to useful organisations for schools that want to explore some of the ideas in more depth. 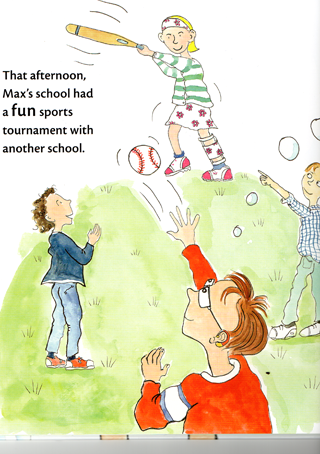 Max the Champion is a hardback book available from all good booksellers or from the publishers. I completely agree with the riveew posted by Littlesheep.I have been using this resource in nurseries and reception classes with the 0 to 5 agegroup.The clips on the Shabang.org.uk website also link to You Tube films which show Kim and Ruben singing the songs and demonstrating the Makaton signs to the accompaniment of Russell on vearios instruments.The songs, activities and actions in the Shabang! repetiore are funny and witty; engaging for adults and children of all ages and stages of development.The actions are based on the latest understanding of neurological development- brain science. Because of the brain and body connection, specific muscle movements, eg. of eyes, hands, tongue etc will help brain cells to develop connections between each other- strengthening the pathways which transport information between the body and the brain.The songs and activities spark creativity because they are a starting block from which children and adults make the songs their own and add to them. My teacher wrote this book, thought I’d share that fact!